Michael Collins Enebeli , widely known as Don Jazzy , is unarguably Nigeria’s most high profile music producer. Beyond his dexterity in the area of music production however, Don Jazzy has shown he is also good when it comes to the discovery and nurturing of raw talents. The Supreme Mavin Dysnasty boss, who worked with D’banj for several years before they parted ways, discovered Wande Coalwhile running one of Nigeria’s biggest music labels, Mo Hits Records (co owned by himself and D’banj). Discovering Wande Coal, famously called the Black Diamond on the streets of Mushin, one of Nigeria’s most notorious slums, Don Jazzy turned him into a fine blend before they parted ways a few years ago. He is also credited with the conversion of former Trybe Records rapper, Dr Sid to a singer with one of the best songs in the land in the last 5 years. So soothing is the transition for the ‘Surulere’ singer that his days of struggling as a rap act is now almost entirely forgotten. 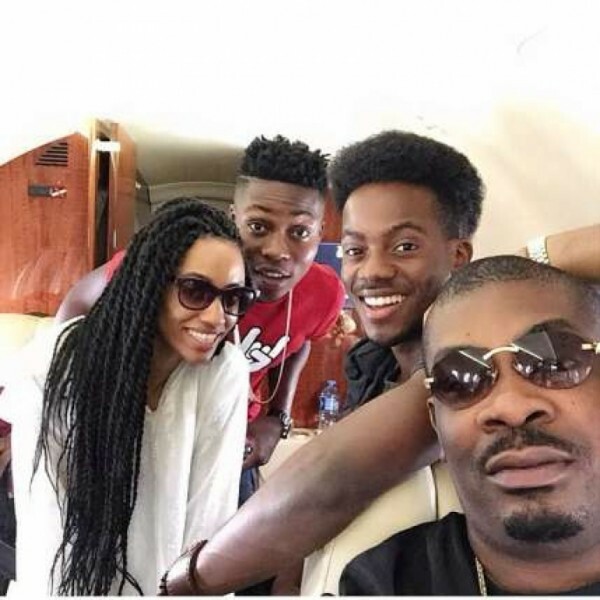 One would think his Supreme Mavin Dynasty was already loaded enough with notable stars like Tiwa Savage, Dr Sid andD’Prince but that streak of nurturing raw talents propelled Don Jazzy into signing Korede Bello, Reekado Banks and Di’ja in February last year. When the three young artistes, fondly called the Mavin 2.0, were unveiled early last year, many criticised the decision, saying it could derail the ambitions of the label. For many of the critics, Don Jazzy should have concentrated more on Tiwa Savage, Dr Sid and D’Prince and was biting more than he could chew by bringing on board 3 acts at a time none of them had released any popular song. Fast forward to just a year later, these young artistes have proved all doubters wrong, buy churning out hit songs in quick succession and becoming music sensations in Nigeria and beyond. This achievement has once again underlined the status of Don Jazzy as a master of the game, whose mastery of production, technical know-how have combined well with the vocal ability of the three to turn them into stars in their own right. What’s responsible for his successes is his understanding of consumer psychology, his ability to listen and connect with music tastes and his relentless passion for making good music. Of course, the A&R exec in him, and the smart kids he’s surrounded himself with, have made sure he picked three kids who are exactly what the fans need at this time. Looking at the Nigerian music terrain, the feat becomes even more incredible considering how long it takes to nurture young talents before they blossom into established acts. It is safe to say no label in recent history has achieved this feat. EME’s Shady and TrippleMG’s Tekno , who many of us thought would give the likes of Davido and Wizkid a big run for their money are still struggling to cement their status but Don Jazzy has succeeded in turning three fresh talents into stars in one year. These Mavins youngsters’ appeared on the scene last year but today, they are rubbing shoulders with the heavyweights in the game. They have been headlining shows across the country and even outside Nigeria. They have been on all major shows in the last one year and even performed at Ghana’s biggest annual musical event, Tigo Ghana Meets Naija where they thrilled the audience to no end. The monster hit, ‘Dorobucci’ is the song that launched them into the music scene but they each of the have gone on to prove their individual skills by releasing their own hit songs. With their solo efforts, they have shown that they are ready to deliver even more. Korede Bello released his first single, ‘African Princess featuring Don Jazzy on February 28, 2014. The industry soon took notice following his performance in ‘Dorobucci.’ Upon the release of his hit single, Godwin, his fan base has tripled and suddenly, it is almost impossible for anyone to ask: ‘Who is Korede Bello?’ no matter the part of the country you reside. He has won the admiration of many ladies especially with his sweet sounding voice and the wink that gets ladies crazy. Even female celebrities are not left out and some have gone as far as kissing him after watching him perform on stage on more than one occasion. He made headlines when Nigeria’s new President, Muhammadu Buhari ’s daughter took the viral picture with him after he had entertained the audience during the new President’s inauguration dinner at the Villa. Reekado Banks, who went by the stage name Spicy prior to his record deal with SMD, was declared the Rookie of the Year at the 2014 edition of the Headies. Reekado Banks premiered his first single, ‘Turn It Up’ on February 21, 2014 which happens to be the same day he got signed to Mavin Records. The song features Tiwa Savage and was released as his first official single under Mavin Records. His other songs, ‘Chop Am’ and ‘Katapot’ are popular hits. Di’ja started her career in 2008. In 2012, she released a number of singles including ‘Dan’Iska (Rudebwoy)’, ‘Hold On’ (Ba Damuwa)’ and ‘How Can We Be Friends’. On February 14, 2015, Don Jazzy announced the addition of the young woman to Mavin Records with her first official single under the label titled Yaro’ an up-tempo celebration of love and commitment against all odds. Her single, ‘Awww’ is one of the buzzing songs at the moment. While the winning formula adopted by Don Jazzy might not be so difficult to figure out; it is surely not all that easy to replicate. This is even more so for record labels that only feast on the star power of established acts without the real desire to invest in the future by recruiting and nurturing talents. With his managing the established acts on one hand and his infinite sense of aligning with the wishes of music lovers on the other, labels with similar ambitions must be ready to become more aware of what the people, especially the young ones, like in this age of social media.